On 10 December human rights lawyer and activist Razan Zaitouneh was abducted from the office of the Syrian Human Rights Violations Documentation Center (VDC) in Douma, Damascus. We are appalled by this! Not only are we working closely with her for the past two years, but she also is one of the few iconic figures the civil uprising against dictatorship and radical islamists still has in Syria. We demand her immediate release! The same day, Razan was abducted together with three of her closest collegues, we published the German translation of the following text of hers in a German newspaper. In the text she accuses the West of trading the Syrian regime’s chemical weappons against the Syrians’ demand for democracy and freedom – with the West giving up humanity. Why does the West insist on dealing with our dead and injured as if they were less valuable than a Westerner – and as if our casualties don’t even deserve respect or compassion? After the chemical massacre in Syria’s two Ghoutas, we believed that the world would, at last, take our interests into account in one way or another. We did not believe that, upon seeing hundreds of dead children, the international community would act only in favour of its narrow interests. The chemical massacre was a milestone, not only in the Syrian revolution, but also in the Syrians’ consciousness and minds. As a human rights activist who has always believed in the humanitarian principles of the United Nations, I can talk for hours about the psychological breakdown and the amount of humiliation I felt after the adoption of UN Security Council resolution 2118. This resolution implies that Bashar al-Assad will continue to rule Syria for at least one more year, with the international community’s acquiescence. The resolution also reveals the lie we have all been living regarding the human rights principles that have not been applied, not even in form, in Syria. If this is how I have been affected, how does the ordinary Syrian citizen, who has never believed our misleading slogans about human unity and equality, feel after suffering such discrimination and injustice? The world goes further in disrespecting the sufferings of the Syrians by awarding the Nobel Peace Prize this year to the Organization for the Prohibition of Chemical Weapons. This award shows the West has exchanged its moral ethical obligations for the legal ones. Meanwhile Assad, the real criminal, is free because no one cares. Appeals have become useless, as if there is a thick wall preventing all calls from reaching the “civilized” West, a region that continues to chart the future of our revolution as if our citizens and rebels no longer exist, and to turn a deaf ear to the will and aspirations of Syrians who have worked hard to make the revolution happen. Now, scenarios for Geneva 2 conference are being suggested along with the many leaks about the proposed American and Russian solutions. The Syrian opposition is being pushed to attend and comply. The West is trying to repeat the Iraqi scenario in Syria in a terrifying, paradoxical way as it refuses to do what it should do under the pretext of not turning Syria into a second Iraq. Yet it practically does nothing but continue to observe the destruction of the Syrian state and society in a way that leaves no space for reconstruction for decades to come, especially with regard to the divided social structures. As is well known, in 2011 Syrians took to the streets in peaceful demonstrations that called for a free, democratic Syria, raising the slogan of “the Syrian people are one,” yet, since then, the West has bet on the development of sectarian strife rather than encourage the peaceful revolutionary movement that started in 2011. Despite all that, we are still fighting many battles against Assad’s brutal, sectarian regime and the regime’s efforts to prevent a just, unified, free Syria. The West pretends to be protecting the minorities, yet has allowed the regime to wage a sectarian war against the majority of Syrians for two and a half years now. The West is using Al-Qaeda and the extremists as a pretext, yet it contributed to their ascendance and popularity by delaying its support to the Free Syrian Army, one of the opposition’s national projects that adheres to an ideology far from extremism and non-national agendas. The West, from the very beginning, has rejected everything the Free Army asked for, starting by refusing to deliver effective weapons or to create a no-fly zone and safe areas for civilians. Then it blamed the FSA for being divided and weak, and for the spread of the extremists. What does the West really want from Syria? The wish to destroy the regime’s chemical weapons and to secure Israel’s borders is completely understandable. But the West should also listen to what Syrians want. Turning a blind eye to the Syrian people’s needs will only lead to the failure of all its plans as no unified opposition – as was recognized – can impose what the “superpowers” agree upon. And the rebellious Syrians are not willing to accept half-solutions after all they have suffered. It is then beneficial for the West to stop disregarding our massacres and martyrs, and to start listening in order to achieve some balance between its interests – which it considers as strategic – and what its current policies are doing to the future of its strategic interests. Syrians will not forget that the international community forced the regime to dismantle its chemical weapons, yet could not force it to break the siege on a city where children are dying out of hunger on a daily basis. “Could not” is not an accurate word for what has happened and what is happening; “did not want” or “did not have the interest” might be more accurate. The Syrians will not forget that. 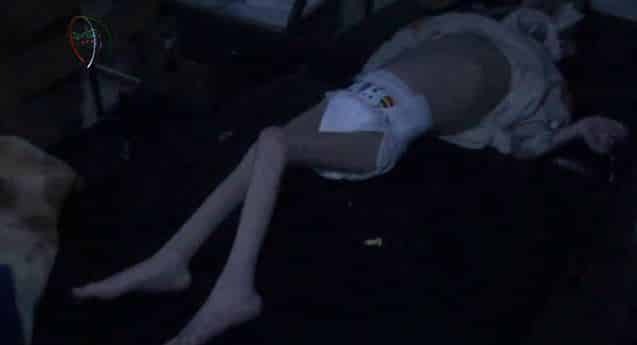 Activists in the Muadamiyah suburb of Damascus say that seven-year-old Duaa is suffering from malnutrition because of the food blockade imposed by Syrian government forces. Credit: YouTube. By the way, in Ghouta, where I currently live, more than 23 children have died during the last three months due to malnutrition and the lack of medicine resulting from the government’s siege here. My friends in besieged Hajar Aswad are eating only one meal a day, consisting of lentils, because it is the only food left there. Of course these “minor details” do not appear to warrant the West’s concern. Such “minor issues” should be on the table of Geneva 2, so the attending members do not have rosy dreams. Yes, all Syrians want to stop the bloodshed by stopping its causes, i.e., by first stopping Assad’s brutal regime, and achieving its actual departure. The West’s strategic interests should not overcome what remains of its humanity. Even if the West continues along the same route, we will not allow that decision to destroy what is left of our determination to continue our revolution till the end. Support the young Syrian civil society in its struggle against dictatorship as well as against radical islamists. Donate for their local projects! This article was originally published on The Damascus Bureau. Razan Zeitouneh has been working as a civil rights lawyer in Syria even before the Syrian Revolution. When the Revolution started, she began documenting regime atrocities – since her activities put her into grave danger, she has been forced into hiding. Still, Zeitouneh keeps working and living in Syria. For her outstanding work in the field of human rights in Syria, Zeitouneh has been awarded with several international prizes. Adopt a Revolution has been republishing several of Zeitouneh’s articles in the past. Since she is monitoring the events in Syria from a local perspective, she is an important voice in the Syrian Revolution. Zeitouneh continues to document human rights abuses via the network Violations Documentation Center in Syria (VDC).